Winner of the 2015 Ruby Griffith Award for Outstanding Achievement in a Musical! 12:45-1:30pm: Backstage tours, a special treasure chest craft activity, temporary pirate tattoos, and meet The Pirate King! Post-show talk-back session with cast and crew immediately following the performance. 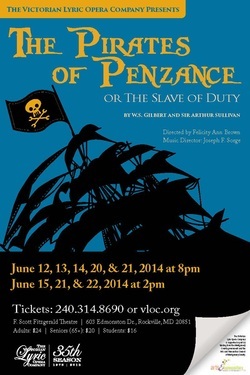 The Pirates of Penzance is supported in part by funding from the Montgomery County government and the Arts and Humanities Council of Montgomery County. 5 stars says DC Metro Theater Arts! "The Victorian Lyric Opera Company and Director Felicity Ann Brown triumph in this dazzling production." When Frederic was a little boy, Ruth, his nurse, was told to apprentice him to become a pilot. She misheard the word and apprenticed him to become a pirate, remaining with them as a maid-of-all-work. Although Frederic loathed the trade to which he had thus been bound, he dutifully served; and, as the curtain rises, his indentures are almost up and he is preparing to leave the band and devote himself to the extermination of piracy. He urges the pirates to join him in a more lawful calling, but they refuse. Ruth, however, wishes to become his wife. Having seen but few women, he does not know whether she is really as pretty as she says she is, but he finally consents to take her. Just then a group of girls, all the wards of Major-General Stanley, happen upon the scene. Frederic sees their beauty - and Ruth's plainness - and renounces her. Of these girls, Mabel takes a particular interest in Frederic, and he in her. The other girls are seized by the pirates and threatened with immediate marriage. When the Major General arrives, he can dissuade the pirates only by a ruse: he tells them that he is an orphan, and so works upon their sympathies that they let him and his wards go free. This lie troubles the Major-General: he sits brooding over it at night in a ruined chapel. He is consoled by his wards' sympathy and Frederic's plan of immediately leading a band of police against the pirates. Meanwhile, the Pirate King and Ruth appear and tell Frederic that they have discovered that his indentures were to run until his 21st birthday, and - as he was born on February 29th - he has really had as yet only five birthdays. Obeying the dictates of his strong sense of duty, he immediately rejoins the pirates. He tells them of the deception that has been practiced upon them, and they seize and bind the Major General. But the police come to the rescue and charge the pirates to yield, "in Queen Victoria's name." This they do. Then Ruth explains that these men who appear to be lawless pirates are really "noblemen who have gone wrong," and they are pardoned and permitted to marry the Major General's wards.